This made my mouth so happy I can’t even tell you how much. You know you’ve landed on something good when you’re sad the left overs are gone. Left overs! I had these stuffed sweet potatoes for four days in a row and on the last one I was genuinely bummed they were all gone. That is until I remembered how easy these are to make. The avocado tahini sauce is the most work and all you have to do there is toss a few ingredients in a blender and hit go. Easy. I’m probably going to be eating these for lunch every day until next year and I’m not mad about it. One thing is for sure – I’ve been grateful to have a few of these ready made in the fridge these past few days. The first half of my morning every day since Thursday has been spent on the phone with American Airlines trying to get tickets and disability seating sorted out for Mike and I next month. By the time I get off the phone with their call centers I feel like my brain is broken. So far I’ve talked to at least 6 different people, have spent who knows how long on hold and I’m still no closer to getting things sorted. Ho hum. Onwards and upwards I suppose. 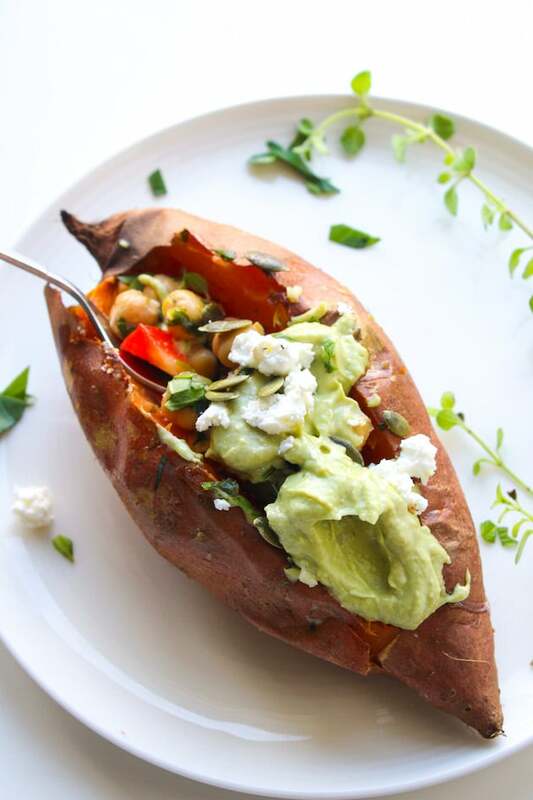 As I mentioned earlier – these sweet potatoes are super easy to make. As far as the sweet potato part goes – just pop them in the oven for about 45-60 minutes until they’re soft and tender. The larger your sweet potato is the longer you’ll need to bake it. While the potatoes are baking away in the oven you can prep the rest of your ingredients. Start with your chickpeas first so they have more time to marinate. Literally all you have to do is chop up your herbs and garlic and mix it in with the chickpeas. Then set them aside and let the flavors do all the work. Marinated chickpeas are really great to have on hand anyways for sides and salads. You’ll love them! As for the avocado sauce – I based this off of one of the avocado tahini I shared on here way back when I first started blogging. I make it all the time and put in on everything. Just throw everything in the blender and process until smooth. If you want a thinner consistency just add another tablespoon or so of water until you get what you want. At least I’ve got these to make my mouth happy whilst my brain is breaking on hold. I hope you enjoy these as much as I do! If you try it let me know what you think in the comments! 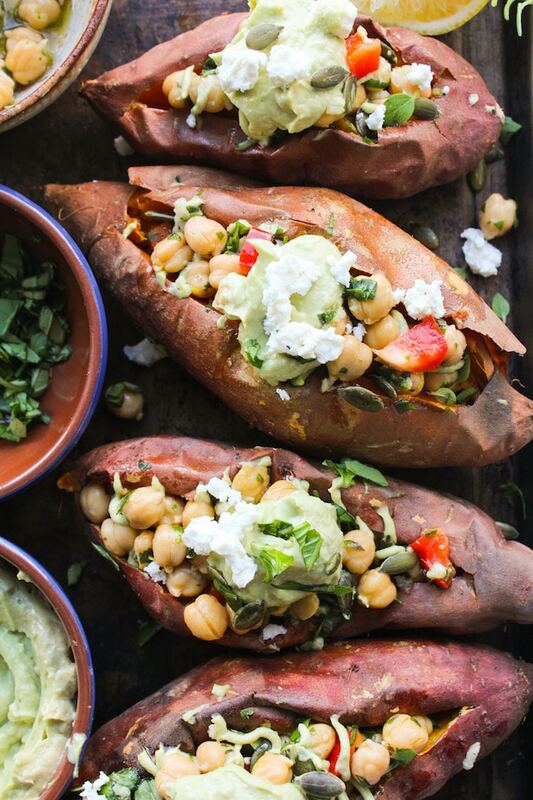 Don’t forget to #asaucykitchen on instagram if you try these stuffed sweet potatoes. We love to see what you make with it! You can also post your pictures to my facebook page! Preheat the oven to 400°F/ 204°C. Use a fork to pierce a few holes in your sweet potatoes to allow air to escape. Place them on a baking sheet and bake for 45 minutes to an hour or until tender to the touch. The large your sweet potato the longer they will need to bake. While the sweet potatoes are in the oven begin working on the chickpeas. In a medium sized bowl combine the chickpeas and the remaining ingredients needed for marinating. Toss the chickpeas until they're all coated in the marinade then set aside for later. To make the sauce, add all of the sauce ingredients to a blender and process until smooth. If you want a thinned consistency add another 1-2 tablespoons of water. Once smooth transfer the sauce to a small bowl and set aside until needed. I've been making feta from this salad on The First Mess . The salad is great too, but the feta is really fantastic and one of the easier vegan cheese recipes I've found. Hi! Excited to make this! Question: In your description you mention garlic in the marinade for the chickpeas but I’m not seeing how much in the ingredient list. Thanks! I’m sorry if I happened to miss this data, but is there any nutritional information on this recipe? I made these tonight and they were AMAZING!!! Definitely going to share with others and will be following you for more delicious food adventures! Thank you! Hi Heather! So glad you liked it! I actually didn’t add nutritional info for this recipe because it’s a tricky on to figure out since there are so many varying parts that depend on how much you end up using. I’ll try to help you figure it out though! The tricky part is the chickpea filling because you’ll end up with extra leftover. If you have 1/4 cup/4 tablespoons of the filling with each sweet potato that comes out to 292 calories. The filling makes roughly 1 1/2 cups so that would get you six servings of the chickpea filling. Thanks Tracey! I think using either of those should work! If you do try it please let me know how it went! Hi Sarah, took me longer than planned to get round to this! But I made it tonight and just used sherry vinegar instead of the lemon juice and zest. I think that worked really well for me. I also didn’t have oregano so used some coriander I had, that was ok but as coriander has such a strong taste I would try it with the oregano next time. Anyhow it all came together beautifully and my hubby said it was great!! We have some of the chickpeas and the avocado tahini left so will use that tomorrow with something else 🙂 I would use these both as part of a larger dip/nibbles meal as they were so yummy! Yay! So glad you guys enjoyed it! Thanks for coming back to let me know how it went! Made this for dinner and loved it! Will be making again! So glad you liked it! Thanks for coming back to let me know how it went! Interesting combination of flavors. I will give it a try! Thanks. I made this last night and we absolutely loved it! Thank you for sharing it! So glad to hear that! Thanks for coming back to leave a comment! This looks like a great weeknight meal. Pinned it for later. Thanks! I love that you made a typical dinner side dish into an epic hearty meal! Sweet potatoes are BAE, but I usually eat them in a boring way, aka microwaved. You took them to the next level by adding the marinated chickpeas and the AVOCADO TAHINI SAusE! Can you tell that I’m obsessed with all things avo and tahini lol ? Sarah–did you make these for me?!! 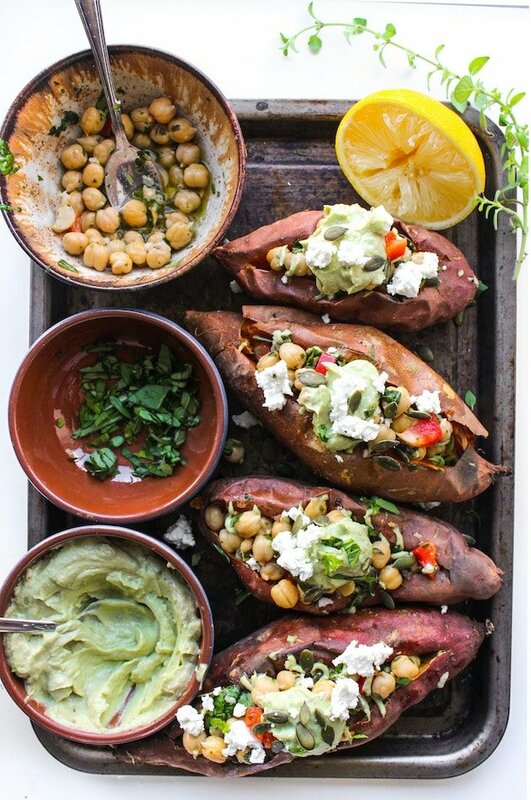 I happen to love sweet potatoes and mediterranean food. LOVE!! Thanks Kristen! I’ll save you one!